Domaine de Panisse has a long history in the Southern Rhone Valley dating back almost 600 years. In 1492, the domaine was the property of the Lord Dominique of Panisse, which as you can see, is where the domaine took its name from. The modern era for Domaine de Panisse starts in 1992, when the vineyard was purchased by Christine Olivier and Jean Marie Olivier. 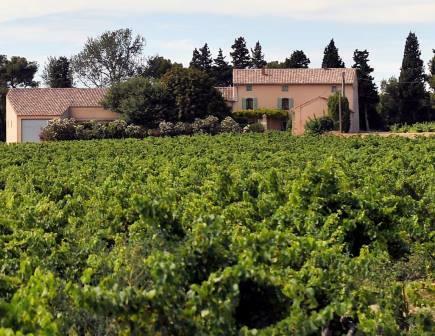 Domaine de Panisse owns 7 hectares of vines in the Chateauneuf du Pape appellation. They also own 16 hectares of vines in the Cotes du Rhone. 100% of the production for Domaine de Panisse is devoted to red Chateauneuf du Pape wines. Domaine de Panisse produces 2 red Chateauneuf du Pape wines. Domaine de Panisse Confidence is produced from a blend of 80% Grenache, 10% Mourvedre and 10% Syrah. Here you find limestone, rocks and sand in the terroir. The grapes are not destemmed. The wine is aged in a combination of 50% used, French oak barrels and the remaining 50% of the wine is aged in tank for 12 months. On average, 350 cases are produced each year. Domaine de Panisse Noble Revelationis a blend of 50% old vine Grenache that comes from vines that range in age from as young as 30 years to almost 90 years of age, (with most of the fruit coming from 80 year old vines) 30% Mourvedre and 20% Syrah. Panisse Noble Revelation is aged in used, French oak barrels for 12 months. The production is on average, 125 cases per year. Domaine de Panisse can be enjoyed on the young side with about 1 hour of decanting, more or less. This allows the wine to soften and open its perfume. Older vintages might need very little decanting, just enough to remove the sediment. Domaine de Panisse is usually better with 2-4 years of bottle age. Of course that can vary slightly, depending on the vintage. In the best vintages the wine should be consumed within 4-14 years after the vintage. Domaine de Panisse is best served at 15.5 degrees Celsius, 60 degrees Fahrenheit. The cool, almost cellar temperature gives the wine more freshness and lift. Domaine de Panisse is best served with all types of classic meat dishes, veal, pork, beef, lamb, duck, game, roast chicken, roasted, braised, stewed dishes, sausage, grilled meats, barbecue and cassoulet. Domaine de Panisse is also good with Asian dishes, hearty fish courses like tuna, mushrooms, salmon, cheese, pasta, eggplant and tomatoes. Domaine de Panisse also produces red wine in the Cotes du Rhone appellation and a Vin de France Rouge wine. Domaine de Panisse Tradition was produced from 44% Grenache, 40% Mourvedre and 16% Cinsault. The grapes are completely destemmed. The wine is aged in cement vats for 12 to months before blending and bottling. The production ranged from 1,250 to 1,500 cases per vintage. Domaine de Panisse Tradition is no longer in production. Full bodied, round and polished the wine offers a freshness, soft tannins and mineral sensation to the peppery red fruit. The wine was made from a blend of 80% Grenache, 10% Syrah and 10% Mourvedre. Medium bodied, approachable, soft, smooth, cherry filled wine. The wine was made from a blend of 50% Grenache, 25% Syrah and 25% Mourvedre. Smoky, truffle scents, polished, rich textures and a deep, ripe, dark, sweet, fruit filled finish. From 60% Grenache and 40% Syrah, the wine reached 14% alcohol. Light in style, with a short, tart, fresh, red berry finish. Drink this young. Medium bodied and already tasty, the black raspberry, garrigue and kirsch notes re easy to find. From a blend of 50% old vine Grenache, 30% Mourvedre and 20% Syrah, the wine is soft, round, fresh and almost there. Give it another year or two, if you like it young. This was the last bottle from the case in my cellar. I am happy to say, each and every bottle has been great and this was no exception. Black jammy fruit, licoirce, , fresh baked plum pie, cola and black pepper aromas filled your nose while the concentrated wine filled your palate with sweet, ripe, fresh dark berries. This outstanding wine is drinking perfect today.